بابایی, مجتبی, ابراهیم زاده اردستانی, وحید, امیریان, الهام. (1396). تعیین لبه‌های بی‌هنجاری‌های گرانی با استفاده از فیلتر ریخت‌شناسی ریاضی ارتقا یافته. مجله ژئوفیزیک ایران, 11(3), 22-32. مجتبی بابایی; وحید ابراهیم زاده اردستانی; الهام امیریان. "تعیین لبه‌های بی‌هنجاری‌های گرانی با استفاده از فیلتر ریخت‌شناسی ریاضی ارتقا یافته". 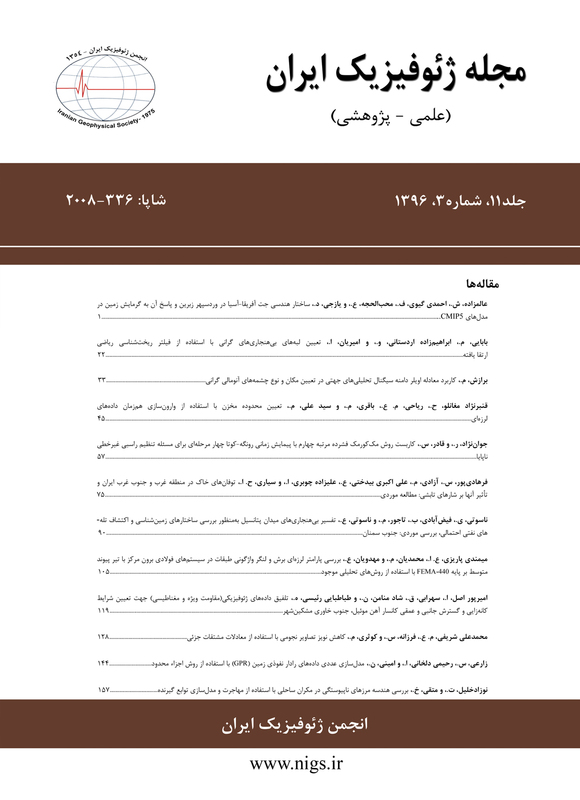 مجله ژئوفیزیک ایران, 11, 3, 1396, 22-32. بابایی, مجتبی, ابراهیم زاده اردستانی, وحید, امیریان, الهام. (1396). 'تعیین لبه‌های بی‌هنجاری‌های گرانی با استفاده از فیلتر ریخت‌شناسی ریاضی ارتقا یافته', مجله ژئوفیزیک ایران, 11(3), pp. 22-32. بابایی, مجتبی, ابراهیم زاده اردستانی, وحید, امیریان, الهام. تعیین لبه‌های بی‌هنجاری‌های گرانی با استفاده از فیلتر ریخت‌شناسی ریاضی ارتقا یافته. مجله ژئوفیزیک ایران, 1396; 11(3): 22-32. تشخیص لبه­های چشمه­های بی­هنجاری، یک ابزار ضروری در تفسیر داده­های میدان پتانسیل است. روش­های زیادی برای تشخیص لبه­ها وجود دارد که بسیاری از آنها شامل فیلترهای بالا گذر بر اساس مشتقات داده­های میدان پتانسیل است. در این مقاله از یک روش تشخیص لبه­ی جدید به نام فیلتر ریخت­شناسی ریاضی پیشرفته (Enhanced Mathematical Morphology) یا EMM استفاده می‌شود. فیلتر EMM به‌صورت نسبت فرسایش مشتق افقی کل به اتساع مشتق افقی کل و یا ترکیبی از این دو عملگر تعریف می­شود. این فیلتر می­تواند لبه­های منابع کم‌عمق و عمیق حتی با چگالی کم ­را به‌طور هم‌زمان نمایش دهد. فیلتر EMM به محاسبه مشتقات عمودی نیازی ندارد که همین امر باعث می‌شود این روش از نظر محاسباتی پایدار باشد. در این مقاله ضمن ارائه رابطه جدیدی برای فیلتر EMM، ابتدا این فیلتر به‌منظور اعتبار سنجی روش، بر روی داده­های مصنوعی با و بدون نوفه اجرا و سپس بر روی داده­های واقعی گنبد نمکی قم آزمایش شد و مرز بی­هنجاری معلوم گردید. Enhancement on the edges of the causative source is a tool in the interpretation of potential field data. There are many methods for recognizing the edges, most of which involve high pass filters based on derivatives of potential field data. In this paper, a new edge detection method is introduce, called the enhanced mathematical morphology (EMM) filter for interpretation of field data. The EMM filter uses the ratio of the erosion of the total horizontal derivative to the dilation of the total horizontal derivative to recognize the edges of the sources, and can display the edges of the bodies simultaneously. Edge detection of the potential ﬁeld data has been widely used as a signiﬁcant tool for geophysical exploration technologies, which can delineate the horizontal locations of causative sources. Normally, various high-pass ﬁlters are used to recognize the edges of the potential ﬁeld data (Evjen 1936; Fedi and Florio 2001; Verduzco et al. 2004; Cooper and Cowan 2006; Cooper and Cowan 2011; Ma and Li 2012; Ma 2013). where imerode (F,SE) and imdilate (F,SE) represent the erosion and dilation of the THD, respectively. The EMM filter was used to recognize the edges of the sources. It can display the edges of the shallow and deep bodies simultaneously. The EMM filter does not require the computation of vertical derivatives, which makes this method computationally stable. The EMM filter is tested on synthetic, and real potential field data in Qom salt dome and the edge detection was done with reasonable results. Ardestani, V. E. and Motavalli, H., 2007, Constraints of analytic signal to determine the depth of gravity anomalies: Journal of Earth and Space Physics, 33(2), 77-83. Arisoy, M. O., and Unal D., 2013, Edge Detection of Magnetic Sources Using Enhanced Total Horizontal Derivative of the Tilt Angle: Bulletin of the Earth Sciences Application and Research Centre of Hacettepe University, 34(1), 73-82. Beant, K., Gurdeep, M., Palak, G., and Jasleen, K., 2011, Mathematical Morphological Edge Detection for Different Applications: A Comparative Study: International Journal of Computer Science and Technology, 2, 216–220. Bournas, N., and Baker, H. A., 2001, Interpretation of magnetic anomalies using the horizontal gradient analytic signal: Annali di Geofisica, 44(3), 506-526. Cordell, L., and Grauch, V. J. S., 1985, Mapping basement magnetization zones from aeromagnetic data in the San Juan basin, New Mexico, In Hinzc W. J. (Ed.). The utility of regional gravity and magnetic anomaly maps: Society of Exploration Geophysicists, 181-197.
Cooper, G. R. J. and Cowan, D. R., 2006, Enhancing potential field data using filters based on the local phase: Computers and Geosciences, 32, 1585-1591.
Cooper, G. R. J., and Cowan, D. R., 2011, A generalized derivative operator for potential field data: Geophysical Prospecting, 59, 188-194. Guo, J. F., Chen, G. L., 2008, Analysis of selection of structural element in mathematical morphology with application to infrared point target detection: SPIE, 6835-68350. Lili, Li, Guoqing, Ma, and Xiaojuan, Du, 2013, Edge detection in Potential-Field Data by Mathematical Morphology Filter: Pure and Applied Geophysics, 170, 645-653. Miller, H.G., and Singh, V., 1994, Potential field tilt: A new concept for location of potential filed sources: Journal of Applied Geophysics, 32, 213-217. Ming, W., Zhi-hong, G., and Luofen, H, 2013, Edge detection of field data using inverse hyperbolic tangent: Geophysical and Geochemical Exploration, 37(4), 655-663. Roest, W. R., Verhoef, J., and Pilkington, M., 1992, Magnetic interpretation using the 3-D analytic signals: Geophysics, 57(1), 116-125. Gil, J. and Kimmel, R., 2002, Efficient dilation, erosion, opening, and closing algorithms: IEEE Transactions on Pattern Analysis and Machine Intelligence, 24, 1606-1617. Serra, J., 1965, Les variables régionalisées et leur estimation: une application de la théorie des fonctions aléatoires aux sciences de la nature: Ph. D. thesis: University of Nancy, France. Serra, J., 1983, Image Analysis and Mathematical Morphology: Academic Press. Sertcelik, I., and Kafadar, O., 2012, Application of edge detection to potential field data using eigenvalue analysis of structure tensor: Journal of Applied Geophysics, 84, 86-94. Verduzco, B., Fairhead, J. D., Green, C. M., and Mackenzie, C., 2004, New insights into magnetic derivatives for structural mapping. The Leading Edge., 23, 116-119. Wijns, C. C. P. and Kowalczyk, P., 2005, Theta map: edge detection in magnetic data: Geophysics, 70, L39-L43.